Did you know that, according to Google data from 2014, B2B buyers do an average of 12 searches before engaging on a specific brand’s site? Twelve!! But with so many different channels to reach B2B buyers and hundreds of lead generation tactics to try, how can you stand out from your competition and break through the noise? 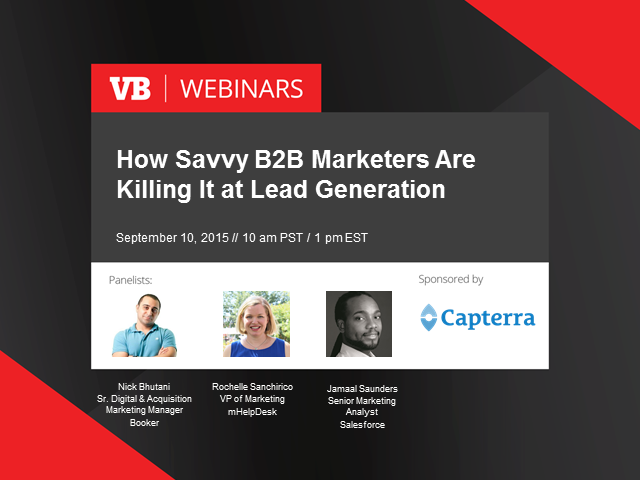 Find out exactly how from three, expert B2B marketers doing exactly that. Our panel of savvy SaaS marketers will share their first hand experiences of what has worked well and what hasn’t in their journey to a fully-optimized sales funnel. Plus, there will be time at the end for Q&A to ask your specific lead gen questions to our panel.